The Solos smart cycling glasses saw a successful Kickstarter campaign around a year ago, and went on to deliver the glasses to backers at the end of last year. Now you don't have to be a backer to get your hands on a pair. That display will let you see running and cycling metrics as you're training, like elapsed time, pace, heart rate, power, cadence and more. You can also pair the Solos with Wear OSsmartwatches, your iOS or Android phone and other BLE or ANT+ devices to track both your metrics and progress. In addition to displayed information, there are also audio prompts that'll give you turn-by-turn directions and read out your metrics for you. You can also set goals in the companion app, and the glasses will let you know how you're measuring up to those goals during each session. Voice control will let you call upon the metrics you want, bringing them into view on your Solos. You can also use it to call friends or complete other functions. The Solos are even equipped with a chip intended to block out background noise. If you'd rather listen to music, you can do that via the bundled in-ear headphones or embedded speakers in the headset. Finally, if you and your buddies each have a Solos headset, you'll be able to link them up for group chat. The headsets will allow users to talk to each other live while on a run or bike ride so that you can keep track of each other and trash talk each other. 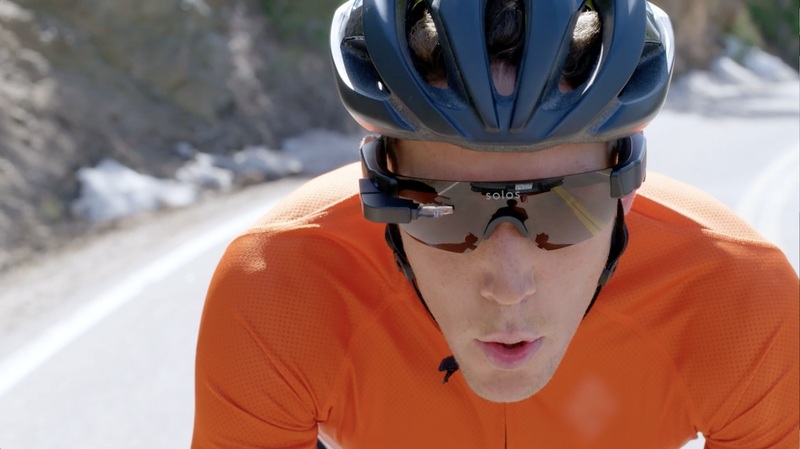 The Solos smart cycling glasses were actually used by the US Cycling team before heading to the Rio Summer Olympics, so you can rest easy knowing that the most elite of the elite took them out for a ride or two. We are hoping to have a sample in the next few weeks, so we'll definitely have a review up on Wareable!